Hi, we have noticed our guinea pig Jasmine's paws are not looking normal. First of all, we saw that there was a something underneath one of her toenails. It is the same material and her toenail, it is like a little block stuck under there. at first we thought it was just dirt stuck but when we tried to pull it off it would't come off. 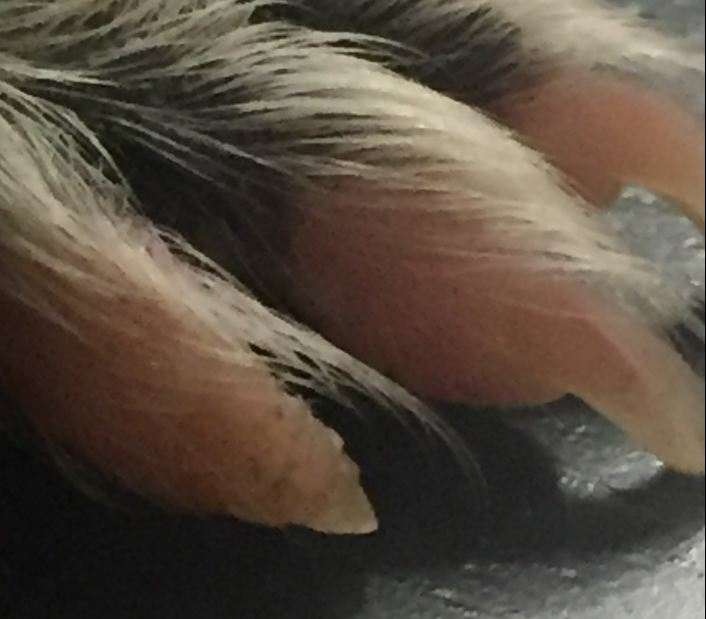 Second, about a week ago we noticed one of her toenails is twisted. It is sideways and on that toe there is a red bump and it looks irritated. Do you have any suggestions for what we should do or any ideas of what it could be? Should we take her to the vet? Also, we have noticed Jasmine is coughing and sneezing a lot. She is not showing any other signs of having a URI or other sickness, she is eating and drinking well, and she is playful and she does not have boogers. Any ideas on what it could be? We think it could be an allergy. Because of the coughing and sneezing, yes, take her to the vet. You do not mention anything about the bedding she is on. A picture of the foot would be helpful. We have recently switched to a carefresh litter box but have fleece in the rest of the cage. She was coughing and sneezing before when we had fleece in the whole cage.I will try to get a picture. Also, because of the cuts we took the litter box out. I sent the image to that email. I would try soaking the foot in a mild warm antiseptic solution. I am guessing what you are seeing may be a "spur" (growth of foot pad) though it is in an unusual location. It may be a fungal infection (dermatophytes) that could be treated with something like Lotrimin, if I remember correctly. Thanks so much for your help! I sent an email of another part of her foot, do you have any idea what that red part is? Thanks! Unsure what part you mean. Looks like it could be a little sore. Yes, foot looks sore. 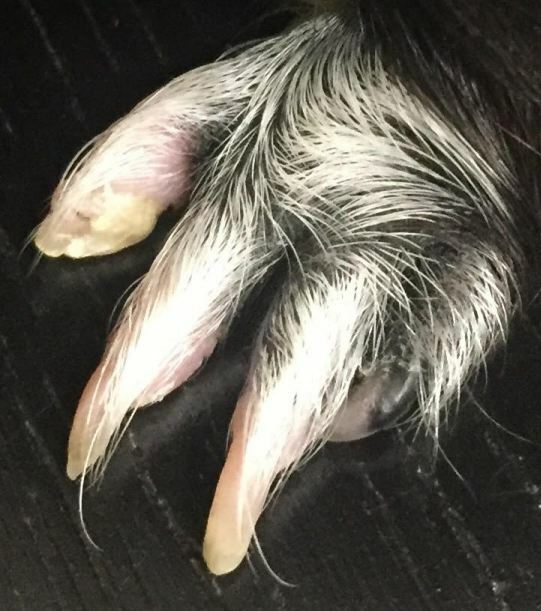 We couldn't find anything on GL or google on sore guinea pig feet, do you have any idea on what could be making her feet sore and swollen and how to help her? Go to the main page of this site (www.guinealynx.info) and click on Index. There's a whole section on Feet. Thanks! I did look through this earlier, and none of the pictures looked like Jasmine's feet. I did look at the spurs section again, it did not look like what she has, but like Lynx said if they are spurs they would be in a weird place. I didn't see anything about sore feet, though. Try some sort of fungal treatment for dermatophytes on the toe (oral or topical, if you can find one). Let us know if it helps. Reddened feet can be caused by irritation from urine in bedding. - Won't the guinea pigs lick the cream off when they are grooming themselves? Also, they step in their hay and food, couldn't it be dangerous if they ingested cream? - Can you use some sort of anti-fungal cream not specifically made for guinea pigs? When you apply any cream of any sort to a guinea pig, you should apply a very thin layer and rub it in well with a q-tip. If you do it that way, they're not going to ingest much medicated cream at all. Ditto bpatters. Use a thin thin layer. Coconut oil could help soften things so it comes off. Thanks! I will let you know how she's doing. Hi, I think Jasmine's toenail fell off. 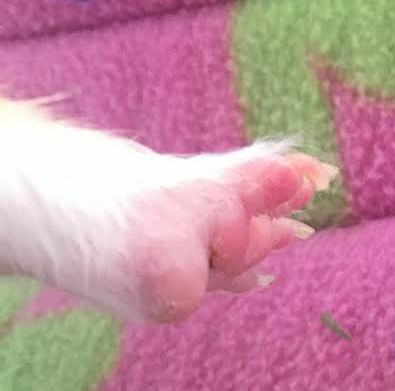 I noticed another cut on her foot and tried to get a picture of it (she is really squirmy, it is easier to set her down on a table and take a picture of her), and after looking at the picture I noticed her toenail looked like it fell off (the whole think not just the weird block). She does not seem to be in pain. The other picture is not recent, I took it a few weeks ago and wasn't looking at it closely, it could have fallen off a week ago. It looks much healthier in this picture. If the whole nail has fallen off, I suspect it was damaged by fungal infection, just like some human toenails. Treatment is necessary, because any new nail will still be infected. Hi everyone! Jasmine has almost stopped coughing, I think it was because of the laundry detergent we used to use. Her cuts have healed, and we started her on some micatin anti-fungal cream. She We also noticed that our other gp, Pigsy, has some fungus-looking stuff on her feet, so we are also giving her some cream. Hopefully the fungus will go away soon. Thanks so much for your help!